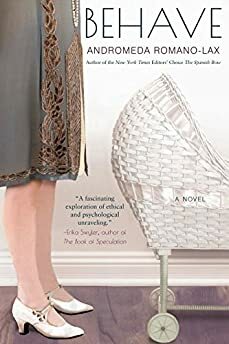 Largehearted Boy: Book Notes - Andromeda Romano-Lax "Behave"
Book Notes - Andromeda Romano-Lax "Behave"
Andromeda Romano-Lax's novel Behave is a fascinating fictional account of the life of Rosalie Rayner Watson, wife of legendary psychologist John B. Watson (the founder of behaviorism). "By detailing how the study of human behavior differs from understanding people, and how smart women can miss the obvious and make mistakes, Romano-Lax sheds a harsh yet deeply moving light on feminism and psychology, in theory and in practice." While writing, I most often listen to music without lyrics, and in the case of Behave, set mostly in the 1920s and early '30s, Gershwin instrumentals, some classical music from the Romantic era, plus a bit of jazz, fit the bill. In imagining a soundtrack for this book, it was fun to add more popular songs with lyrics that my characters, especially my narrator Rosalie, would have enjoyed, sometimes defiantly. In making the list, I loved discovering how the great songs of the period—often desperately romantic— could "talk back" to the book's principal subject, Behaviorism, a school of psychology that oversimplified the range of human emotions and maintained that the mind (and the soul) don't exist. My characters, scientists Rosalie and John Watson, pretend to be rational but in fact that they are emotional, impulsive, reckless, and passionate. Choosing these songs was a way to inject some irony and add another layer, beyond what these scientists could comfortably express about their own roiling desires. Liszt was typical ceremony fare in the era when Rosalie graduated Vassar College and this piece, "Dreams of Love," typifies the aching romanticism that Rosalie and her peers pretend to put behind them while waving banners of progress in the post-World War I, suffragette era. I did a lot of primary document research for this book, searching for traces of a woman who was mostly forgotten by time, and every scrap helped: even graduation speech transcripts and ceremony announcements detailing the music played around the time Rosalie attended Vassar. Liszt, Bach, Wagner, and Franck were de rigueur. As romantic as Liszt but even more haunting and intimate, this is a companion piece I imagine reflecting Rosalie's inner mental state during the long, hot summer as she waits for her new life—as research assistant to psychologist John Watson, at Johns Hopkins University in Baltimore—to begin. Chopin wrote, "I wish I could throw off the thoughts which poison my happiness, and yet I take a kind of pleasure in indulging them." As a music listener, I take huge pleasure in beautifully sad music, and as a writer, I am attracted to tragic stories and screwed-up lives. Chopin gets me. Early critics had a hard time deciding if this piece was classical or jazz, which makes it a great piece to represent the 1920s, when everything (hemlines, morals, scientific knowledge) was changing fast and yesterday's labels no longer fit. I decided to include this piece in the list rather than Rhapsody in Blue mainly because the latter piece is better known and a touch too upbeat. Having said that, one of my fondest memories while writing Behave took place at a writing retreat in Virginia, near the Appalachian Trail. Toward the end of a crazy writing jag (25,000 words in 5 days) I ran up a trail to a waterfall looking out over a misty valley, with Gershwin's Rhapsody blasting through my earbuds. Back at the writing desk, I mellowed back into the zone with this Adagio, written the following year: equally lush, less manic. Rosalie wanted it, and she got it: He's the big affair/ I cannot forget/ Only man I ever think of with regret. Because this song was used so effectively by Woody Allen in the film Manhattan, it's almost impossible to hear it without picturing New York City, especially the Queensboro Bridge, which John Watson mostly likely crossed daily in the early 1920s, en route to his posh ad-man job. (Fired from academia, Watson turned to advertising—a profitable move.) The lyrics themselves, in which a softhearted woman pleads enchantingly for a man to watch over her, are utterly retro and anti-feminist, but there's the rub: giddy love and egalitarian standards rarely go hand in hand. As Rosalie finds out. By the way, George Gershwin intended this piece to be more up-tempo, but Ira convinced him to slow it down. Good going, Ira. I completely agree. Rosalie and John pretended to be strict rationalists yet John wrote his young lover goopy love notes—which ended up in the ends of his spurned wife, Mary, who leaked them to the press and used them in a divorce trial that made east coast headlines. Rosalie, meanwhile, was willing to throw away everything for her paramour, blind to the potential for scandal and difficulties ahead. Things are going to be easy? No way, honey. This early 1940s recording came out long after the original, but no matter the version, this song takes me back to the great age of nightclubs and dancing all night, which somehow seemed more fun when booze was illegal. The lyrics—You made me love you/ I didn't want to do it—emphasize why rational science can't tell us everything about love in all its self-deluding and self-defeating varieties. I've listened to more classic versions but my heart leaps in response to the first I heard as a young teen, from the 1980s movie Cotton Club. That movie, which I saw again and again (bought the soundtrack on cassette as well) transported me to the Jazz club era. How I longed to live in that time period for just an evening! As a 13-year-old, I never imagined I would someday write historical novels set in the '20s, '30s, and '40s. Instead of time traveling for hours, I've had the pleasure of time traveling for years. John Watson didn't believe in mind or soul, but I do believe he loved Rosalie and never recovered from her death in 1935. With their downright sentimental or politically incorrect lyrics, songs often manage to capture heartache better than science or reason. Watson would have had a hard time saying aloud these lines, but deep down, as a closet romantic, he would have felt them: My life revolves about you / What earthly good am I without you / Oh I tell you I mean it / I'm all for you, body and soul. Many versions abound but regardless of the singer, the lyrics hit hard. After all the loving and living, fighting and confessing, do we ever really know what's happening inside another person's mind? In Behave, my two psychologist characters seem no more astute about real human behavior –their own, or others'—than the average person. Which is why I arrive at the penultimate item on this list with Norah Jones singing: "Well, you don't know me." Rosalie Rayner Watson died unexpectedly of dysentery at the age of 36 after a month-long period of illness. I end this list with a return to the music that bed-bound Rosalie might have mentally replayed as she rolled the clock back, remembering the span of her short life, from the turn of the twentieth century into the Depression Era. This particular performance by cellist Du Pre and her pianist husband Daniel Barenboim was Du Pre's last recording, which makes it all the more poignant. Forced by multiple sclerosis to retire at the age of 28, the renowned cellist died at 42. While Du Pre was undoubtedly more famous, she and Rosalie share a tragic arc: pulled away from their careers in youth and gone by early middle age, they were prevented from achieving all they could. Even so, their influences and their echoes remain.